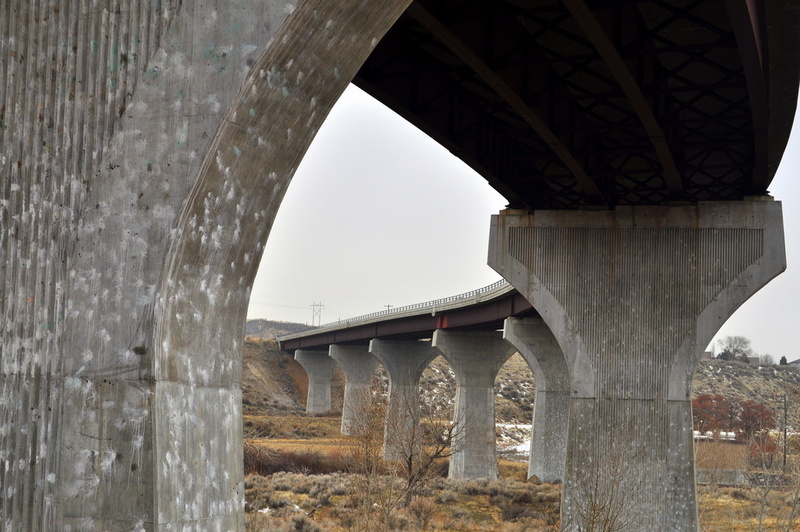 This photo was taken under a raised highway spanning the Boise River. I was interested in the shapes of the repeating concrete support pillars. To me they look like giant nails pounded into the ground. I wish the sky had some color, but our weather is endlessly dreary these days. I like this, Lisa. Great POV and repetition! It's an impressive looking bridge Lisa. I see what you mean about it looking like nails hammered into the ground. I don't suppose they light it up at night do they? Like your composition here and the criss-crossing lines. Another spectacular composition the pov is superb and the framing through first arch excellent : love the subdued tones ! nice pov and composition, really cool! You have such a good eye for lines and structure.. your shots are always so well balanced.. really like this one!! love the pov and the angles. Very cool shot! Love the composition! Great composition! A very cool shot! Our weather is much the same. Like the lines here. I haven't seen the sun in days either!! Nice shot. I like your pov, the angled lines and repeated shapes. I can see the nails. Great POV & great shot. beautiful pov and nice piece of architecture! Great composition! I love the lines in this. Brilliant angles and shapes.Excellent POV,well thought out and executed shot. Our skies have been switching back and forth- one day blue, one day gray. It's enough to say, "Make up your mind already!" Nice composition and well-spotted. The bridge really makes a nice pattern throughout the picture, but watch your horizontals- it seems a bit tilted to me. @olivetreeann Thanks for your comment, Ann. You are right about the horizontal. I noticed too after I had posted. I have since made the correction. I appreciate the constructive feedback! @topcat Thank you, Kevin. I appreciate your comment! @bella_ss Thank you so much, Sheralee! @nicoleterheide Thank you for your comment, Nicole! @david68 Thank you for your comment, David. @cmc1200 Thank you, Caryn. Are you guys dealing with inversions, too? I find them so depressing. Makes me want to drive to the mountains every day! @dawn_butler Thank you so much, Dawn! @ashesand Thank you for your comment, Cindy! @jankoos Thanks so much for your comment and continued support, Jan! @kmwilliams Thanks so much for your comment! @timandelke Thank you for your comment, Elke! @aleksandra Thanks so much for your comment, Aleksandra! @ingrid2101 Thank you for your comment, Ingrid. @dolphin Thank you for your comment, Molly! @janettee Thank you so much, Janette! @paul2782 Thank you for your kind comment, Paul. Glad you liked it. @fueast Thank you for the comment, Allison! @timrox Thank you for your comment, Tim. Unfortunately they do not light up at night. It would be a great shot if they did. @stu_b Thanks Stu. I liked the texture in the concrete, too. It happens to be a place where kids play paintball, although there are signs all over prohibiting this. The paint splatter creates some interesting designs in places. Thanks again for your comment! @amandalomonaco Thank you, Amanda! I appreciate your comment! I love the pov! Very cool! Great pov and repetition. I agree to you about the sky. Please repeat this shot again with blue sky or stormy clouds. I really love the curve of the bridge! Such a great POV! I wish I could send you some of our beautiful blue skies! But I think the gray skies really add to a sort of industrial look to the shot. @emrob Thanks so much, Mandy. You are so sweet. I would so gladly take some of your blue skies. You have no idea... I do have to agree that the grey is fitting here. So appreciate your comment! @noragentian Thank you for your comment and follow, Ruth. I will definitely return to shot on a blue sky day. It reminds me of a Roman aquaduct. I love how you framed the columns with the foreground section. I really like the perspective,and composition. I would not have thought about it but they do look a lot like nails. Awesome, I love the point of view! @annethomson @pammerritt @lisabell Thank you for your kind comments.